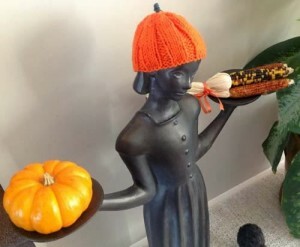 While we are excited that the holiday season will soon be getting underway, we’d like to take a moment to enjoy the fall festivities too! In that spirit, we would like to share with you some pictures that our customer Joanne from Canada just sent to us. 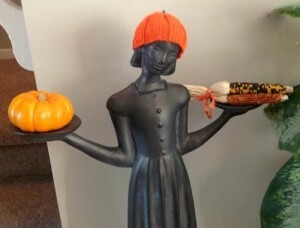 She recently purchased a Savannah Bird Girl statue from us, and has since accessorized her with an adorable pumpkin hat (which she made) as well as a gourd and Indian corn. If you have creative photos that you would like to share, please do! We would love to see them and share with your permission. To see our selection of bird girl statues, please click here.